Product #6548 | SKU SA63 | 0.0 (no ratings yet) Thanks for your rating! Use AKG's SA 63 Stand Adapter for the C1000S to safely mount the large shaft condenser on a conventional mic stand. Adjustable angle makes it easy to point your mic toward the source. The SA 63's screw thread fits standard 5/8" (1.6 cm) microphone stands. The SA 63 is made wide enough to support AKG's popular 3.4 cm diameter condenser. 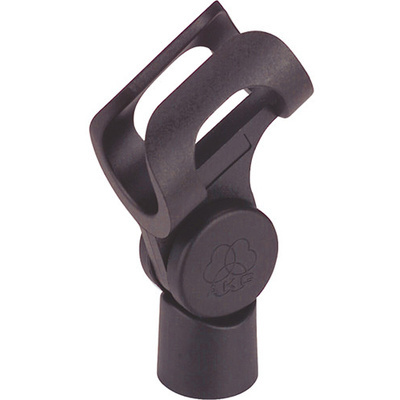 The Mic Stand Adapter holds on to your mic, freeing your hands and providing stability. Clean your performances of handling noise and maintain a consistent mic position in the studio. Rubbery plastic grip hugs your mic tightly without scratching it. Pliant material also makes it easier to mount and remove mics without a lot of friction noise.